With the latest online search frequency data in from Wine-Searcher, we can see which wines rose in popularity during November. Each month we look at the last three months’ worth of search data, measured against the previous period, to see which wines have grown most in popularity. With five of the world’s six most popular wines making the greatest gains during November, it appears that demand for the biggest brands shows no sign of diminishing, and that the public is quick to pick up on announcements regarding the most famous fine wine producers. Mouton, the world’s second-most popular wine, made the greatest gains during November. This is likely thanks to the release of the label for the 2015 vintage. 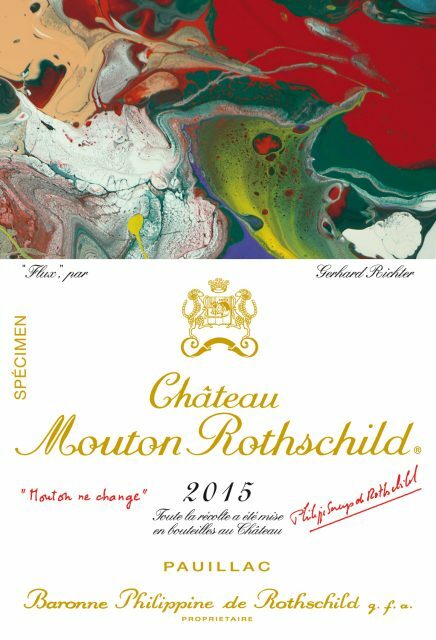 It features a witty juxtaposition of Gerhard Richter’s “Flux” with the reiteration of part of Mouton’s motto, “Mouton ne change” (Mouton never changes), in the context of a generational shift as Philippine de Rothschild’s three children take the helm after her death in 2014. Snapping at Mouton’s heels was Margaux. It too announced during November that it will release its 2015 vintage in a commemorative bottle – the first time the château has done so – paying homage to Paul Pontallier who was winemaker at the property for almost 30 years. 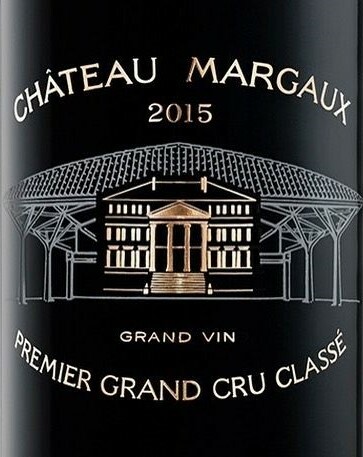 With Margaux 2015 achieving one the best Quality scores of the vintage, it seems a fitting tribute. Lafite came next. In mid-November it was announced that in March 2018 Saskia de Rothschild will be taking over as chairwoman of the château and Jean-Guillaume Prats of Moët Hennessy will become President and CEO. With Lafite currently the most popular wine in the world, and one of just five wines on Wine Lister to achieve a Brand score of 999 – alongside Dom Pérignon Vintage Brut, Mouton, Latour, and Yquem (no wine scores 1,000) – the duo have a formidable reputation to maintain. Latour was the fourth-biggest gainer, its search frequency increasing 8% (4,317 searches). Whilst the increased interest in the other Médoc first growths can be attributed to a significant announcement, the reason behind Latour’s surge in popularity is less obvious. Related news is of course the acquisition by Artemis Domaines – Latour owner François Pinault’s holding company – of Burgundian Grand Cru monopole Clos de Tart. 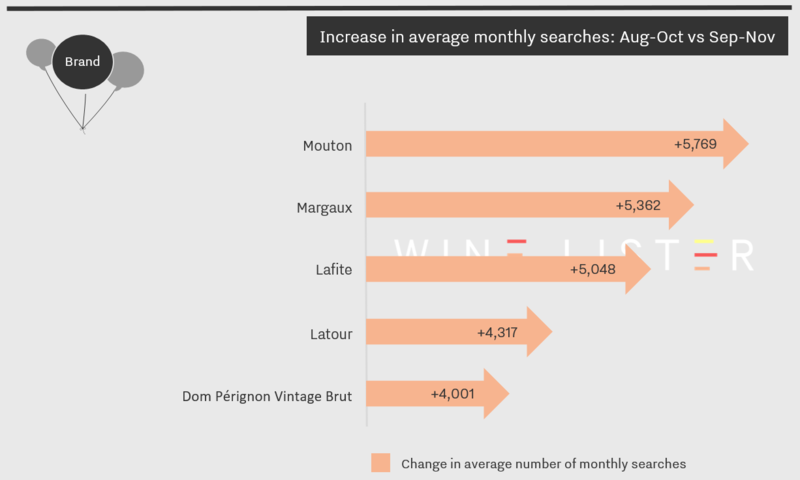 Breaking the Bordeaux first growths’ dominance on this month’s popularity stakes was Dom Pérignon, a brand whose online popularity has soared over the second half of the year. Early in November Moët Hennessy announced the launch of Clos19, an online shop selling its prestigious brands – one of which is Dom Pérignon. Cannily introduced before the festive season, during which Champagne’s popularity surges – it seems that the region’s strongest brand has further benefited from the new platform. First-mover advantage for Angélus 2018?